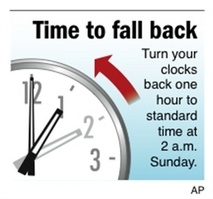 At 2:00 a.m. local on Sunday, most of the United States (except Hawaii and Arizona) will leave daylight saving time behind and fall back an hour to standard time. The annoyance of resetting clocks (or forgetting to, and showing up an hour early for appointments on Sunday) may raise the question of why we bother with this rigmarole in the first place. Daylight saving time is most often associated with the oh-so-sweetextra hour of sleep in fall (and the not-so-nice loss of an hour in spring), but some of the original reasons for resetting our clocks twice a year including saving energy and having more daylight hours for retailers, sporting events and other activities that benefit from a longer day. As far back as the 1700s, people recognized the potential to save energy by jumping clocks ahead one hour in the summer – Benjamin Franklin even wrote about it – although the idea was not put into practice until the 20th century. During both World Wars, the United States and Great Britain began observing daylight saving time. After the war, U.S. states were free to choose whether to observe daylight saving time and the calendar start dates of the time change. The result was time confusion for travelers and newscasters. In 1966, Congress enacted the Uniform Time Act, which stated that if any state observed daylight saving, it had to follow a uniform protocol, beginning and ending on the same dates throughout the country. Starting in 2007, the Energy Policy Act of 2005 lengthened daylight saving time by four weeks, starting it three weeks earlier in spring and ending it one week later in fall. Daylight saving now begins on the second Sunday in March and ends on the first Sunday of November. Formerly it began on the first Sunday of April and ended on the last Sunday of October, so that extra week gives trick-or-treaters a precious extra hour of candy-gathering before sunset. But not everyone is wild about daylight saving time, with some states opting out all together and others proposing to do so. Hawaii has never observed daylight saving time, as its tropical latitude means its daylight hours stay fairly constant year-round. Arizona likewise has not observed daylight saving time since 1967 because the extra daylight in the summer would just mean more energy consumption to keep the desert state’s residents cool. Many Alaskans would like to stop observing daylight saving time because the change in daylight from summer to winter is already so extreme at their northerly latitude. A petition has even been set before the state this year to abolish the observance of daylight saving time in Alaska. Florida too finds daylight saving time less useful because of it’s southerly latitude. In 2008, a Florida state senator introduced a bill to abolish the practice in Florida. From 1970 to 2006, most of Indiana didn’t observe daylights time, but began to do so in April 2006 after eight counties in the western portion of the state switched from the Eastern to the Central Time Zone. None of the U.S. territories, including Puerto Rico and the U.S. Virgin Islands, observe daylight saving time.